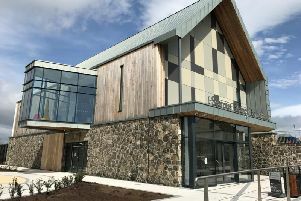 Johann Muldoon, managing partner of Moneymore based practice Manor Architects, headed off stiff competition to claim the prestigious accolade of Best Woman Architect in Europe at the Women in Construction and Engineering Awards in London. Awards are nothing new for Johann or Manor Architects having been awarded Mid Ulster business person of the year in 2012 and 2015 as well as SME of the year 2016. Best Woman Architect in Europe is the latest in a these awards for Johann Muldoon. Just last month one of her projects was shortlisted for the worldwide Architectural Review Future Projects Awards, however this latest recognition of her achievements is particularly poignant and has secured a place for Manor Architects on the map. “Winning this award is not only a momentous occasion for me in my career, but gives me a fantastic platform to promote my passion for the role of females in architecture and the substantial contribution they can make to the economy and built environment,” says Johann. “ Women are seriously underrepresented, particularly at senior levels in practices throughout Europe but as a female running a successful firm as well as being a farmer’s wife and mother to two young children, I believe that it is possible to have a flourishing career and a fulfilling family life.” She added it was an experience and an accolade that she would carry with her for the remainder of her life.